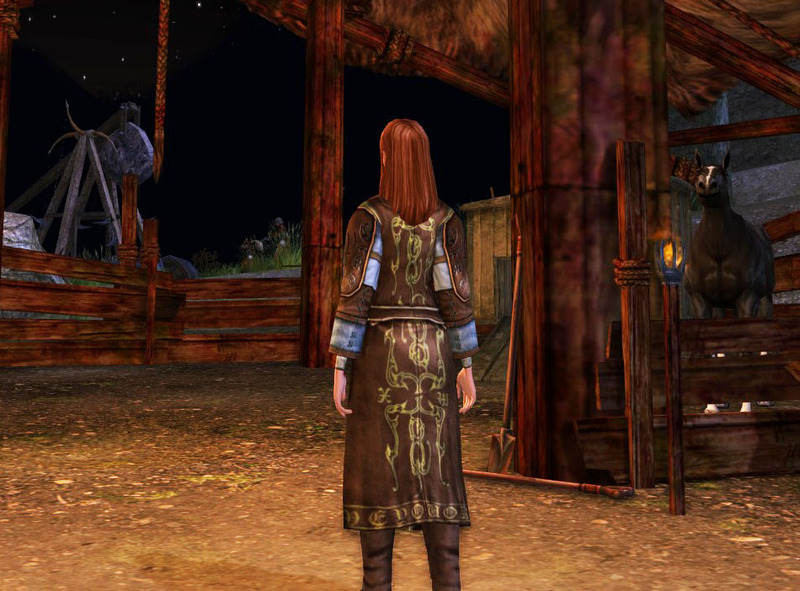 I’ve recently highlighted the Great Hoary Aurochs Robe; rest assured, I love it. No pic here, but click the link. 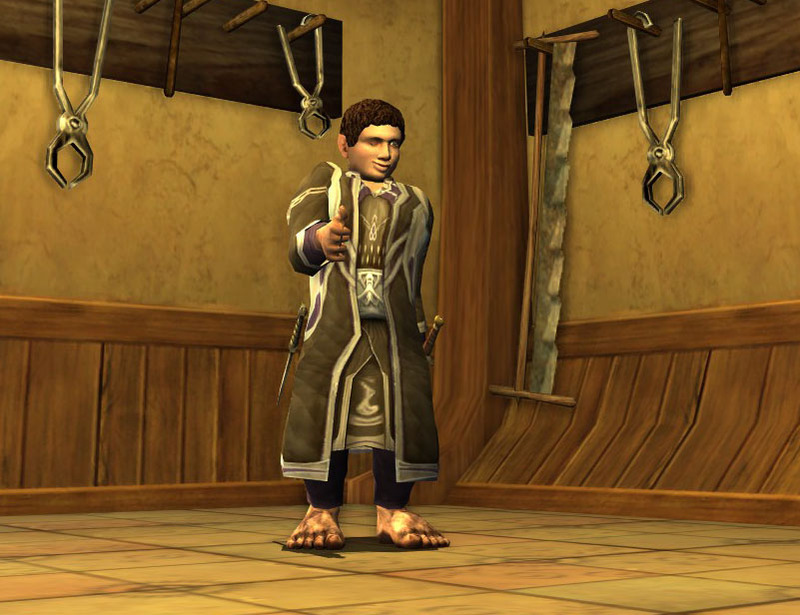 The Lawgiver’s Robe (available in the LOTRO Store) pleases me somehow: it has such a stern, upright look to it, and I’ve used it several times for characters who are on the solemn, formal side. 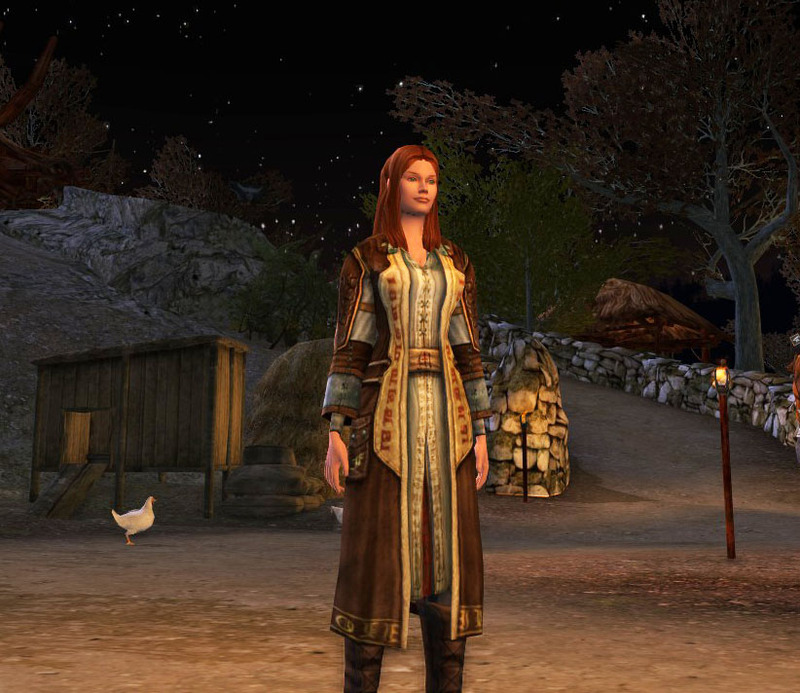 Formality is also well-served by the lovely Yule-fest deed reward, the Frostbluff Robe of Thanks. Rich colors suit it well. It’s less Victorian than some of the other Yule rewards, which pleases me. I am not a fan of Dickens in my Tolkien. One of my favorite robes in the game, in front of my hands-down, absolute favorite wallpaper in the game. 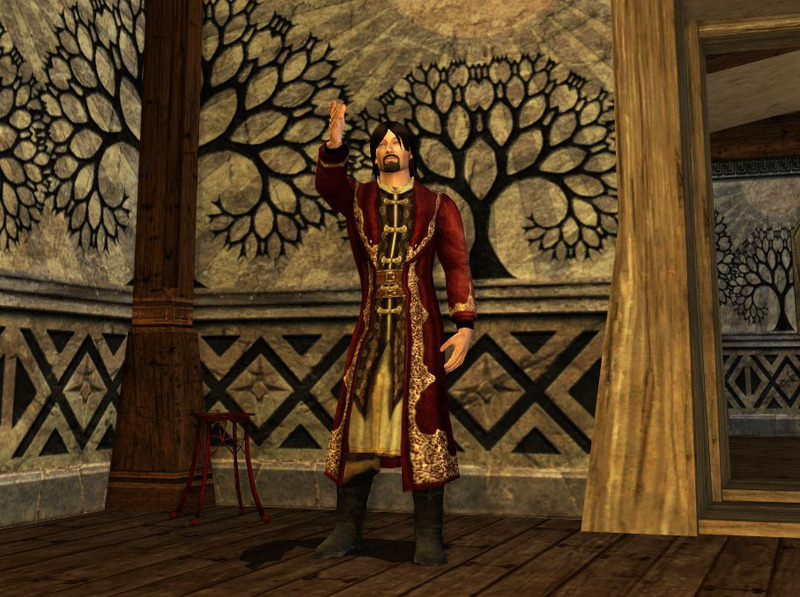 I adore the (Ceremonial) Robe of the Learned. The details are stunning, the dyes rich. It’s just gorgeous. Isn’t the knotwork on the back of the robe gorgeous? 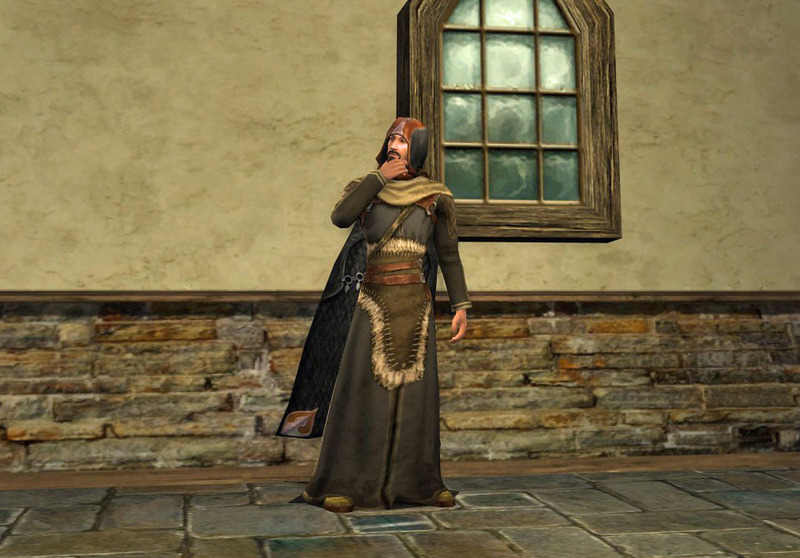 And finally, at least for this post, I’d love to highlight the Ferrier’s Robe (available in the LOTRO store). 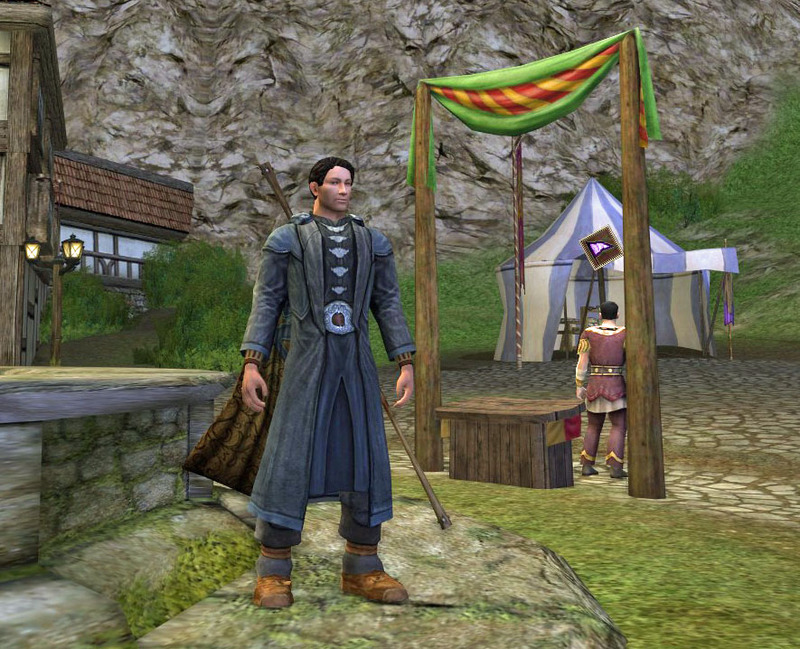 It’s a great, medieval-looking item that suits my Rohirrim characters well. I also like that it looks good (for shapeless big robe definitions of “good”) on both male and female toons. Did I leave the hearth on? So what are your favorite robes? “Did I leave the hearth on?” Ha, your captions crack me up I love the Robe of the Learned, although it was a while after I owned it before I realize that the back was awesome as well. Haha, lolling hard at the tools and/or torture devices! Robe of the learned stag! That’s probably my fav. The Long Fancy Robe got used over the past week by some of my characters for a sea-faring/piratey sort of look. I love allll of these. Especially the Robe of the Learned. And the Ferrier’s robe. Alright, all of them. I do love others, too. The Silver-Voice robe is gorgeous, and the Robe of Elder Days. I like that other one that looks like the starter elven robes, but more fancy. I think the world drop is called the Western Robe, and it’s a reward for the epic quest juuust before gaining access to Moria.